← Sage Cafe – Awesome Food Meets Awesome Art! 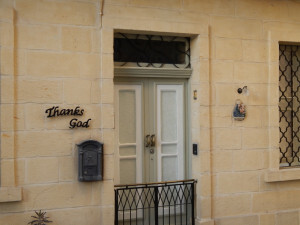 One thing stood out above all in a recent visit to Malta. This island nation is an archipelago of a mere 4 small islands – only 2 of which are inhabited – yet it has more churches than there are days in the year. The churches, cathedrals and basilicas also rival famous ones worldwide. It boasts some of the largest domes in Europe – Mosta has the third largest unsupported dome in the world and the third largest in Europe. Here in my very own Rhode Island, our state capitol has the 4th largest unsupported marble dome in the world. In part because Paul shipwrecked here on his way to Rome, the country had some of the earliest Christians in the world and to this day 98 percent of the population is Catholic and living a life embedded with faith, actively attending church and participating in religious feasts, etc. In this milieu of religiosity, it was especially fitting for the male a cappella choir, Oneness-Dream, to perform a free concert of devotional music in a beautiful church in Valletta – the Basilica of Our Lady Mount-Carmel. Striking to me is the image of the Blessed Virgin Mary and baby Jesus with an actual crown. Oneness-Dream in Concert – Valleta, Malta from Sharani Robins on Vimeo. Nice video and blog. Looks like a great church. Yes, the church was beautiful and the acoustics within added a rich depth to their voices. Thanks for taking us for a moment to Malta, Sharani.